In particle physics, an elementary particle or fundamental particle is a particle that does not have a substructure, as far as is known; that is, it is not known to be made up of smaller particles. Particles that have no substructure could be considered the basic building blocks of the universe from which all other particles are made. Historically, the hadrons (mesons and baryons such as the proton and neutron) and even whole atoms were once regarded as elementary particles. In the Standard Model, the quarks, leptons, and gauge bosons are elementary particles. Central to elementary particle theory are the concepts of "quanta" and "wave-particle duality," which revolutionized the understanding of particles and electromagnetic radiation, and brought about quantum mechanics. All elementary particles are either bosons or fermions (depending on their spin). The spin-statistics theorem identifies the resulting quantum statistics that differentiates fermions from bosons. According to this methodology: particles normally associated with matter are fermions, having half-integer spin; they are divided into 12 flavors. Particles associated with fundamental forces are bosons, having integer spin. 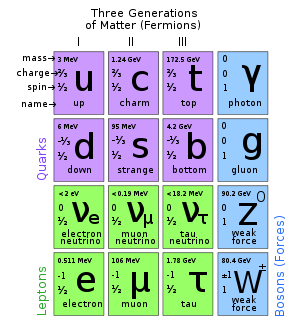 The Standard Model of particle physics contains 12 flavors of elementary fermions, plus their corresponding antiparticles, as well as elementary bosons that mediate the forces and the still undiscovered Higgs boson. However, the Standard Model is widely considered to be a provisional theory rather than a truly fundamental one, since it is fundamentally incompatible with Einstein's general relativity. There are likely to be hypothetical elementary particles not described by the Standard Model, such as the graviton, the particle that would carry the gravitational force or the sparticles, supersymmetric partners of the ordinary particles. The 12 fundamental fermionic flavors are divided into three generations of four particles each. Six of the particles are quarks. The remaining six are leptons, three of which are neutrinos, and the remaining three of which have an electric charge of −1: the electron and its two cousins, the muon and the tauon. Quarks and antiquarks have never been detected to be isolated, a fact explained by confinement. Every quark carries one of three color charges of the strong interaction; antiquarks similarly carry anticolor. Color charged particles interact via gluon exchange in the same way that charged particles interact via photon exchange. However, gluons are themselves color charged, resulting in an amplification of the strong force as color charged particles are separated. Unlike the electromagnetic force which diminishes as charged particles separate, color charged particles feel increasing force. However, color-charged particles may combine to form color neutral composite particles called hadrons. A quark may pair up to an antiquark: the quark has a color and the antiquark has the corresponding anticolor. The color and anticolor cancel out, forming a color neutral meson. Alternatively, three quarks can exist together, one quark being "red," another "blue," another "green." These three-colored quarks together form a color-neutral baryon. Symmetrically, three antiquarks with the colors "antired," "antiblue" and "antigreen" can form a color-neutral antibaryon. Quarks also carry fractional electric charges, but since they are confined within hadrons whose charges are all integral, fractional charges have never been isolated. Note that quarks have electric charges of either +2/3 or −1/3, whereas antiquarks have corresponding electric charges of either −2/3 or +1/3. Evidence for the existence of quarks comes from deep inelastic scattering: firing electrons at nuclei to determine the distribution of charge within nucleons (which are baryons). If the charge is uniform, the electric field around the proton should be uniform and the electron should scatter elastically. Low-energy electrons do scatter in this way, but above a particular energy, the protons deflect some electrons through large angles. The recoiling electron has much less energy and a jet of particles is emitted. This inelastic scattering suggests that the charge in the proton is not uniform but split among smaller charged particles: quarks. In the Standard Model, vector (spin-1) bosons (gluons, photons, and the W and Z bosons) mediate forces, while the Higgs boson (spin-0) is responsible for particles having intrinsic mass. Gluons are the mediators of the strong interaction and carry both colour and anticolour. Although gluons are massless, they are never observed in detectors due to colour confinement; rather, they produce jets of hadrons, similar to single quarks. The first evidence for gluons came from annihilations of electrons and antielectrons at high energies which sometimes produced three jets—a quark, an antiquark, and a gluon. There are three weak gauge bosons: W+, W−, and Z0; these mediate the weak interaction. The massless photon mediates the electromagnetic interaction. Although the weak and electromagnetic forces appear quite different to us at everyday energies, the two forces are theorized to unify as a single electroweak force at high energies. This prediction was clearly confirmed by measurements of cross-sections for high-energy electron-proton scattering at the HERA collider at DESY. The differences at low energies is a consequence of the high masses of the W and Z bosons, which in turn are a consequence of the Higgs mechanism. Through the process of spontaneous symmetry breaking, the Higgs selects a special direction in electroweak space that causes three electroweak particles to become very heavy (the weak bosons) and one to remain massless (the photon). Although the Higgs mechanism has become an accepted part of the Standard Model, the Higgs boson itself has not yet been observed in detectors. Indirect evidence for the Higgs boson suggests its mass could be around 117 GeV, or even as high as 251 GeV. In this case, experiments at the Large Hadron Collider (LHC) may be able to discover this last missing piece of the Standard Model. Although all experimental evidence confirms the predictions of the Standard Model, many physicists find this model to be unsatisfactory due to its many undetermined parameters, many fundamental particles, the non-observation of the Higgs boson and other more theoretical considerations such as the hierarchy problem. There are many speculative theories beyond the Standard Model which attempt to rectify these deficiencies. One extension of the Standard Model attempts to combine the electroweak interaction with the strong interaction into a single 'grand unified theory' (GUT). Such a force would be spontaneously broken into the three forces by a Higgs-like mechanism. The most dramatic prediction of grand unification is the existence of X and Y bosons, which cause proton decay. However, the non-observation of proton decay at Super-Kamiokande rules out the simplest GUTs, including SU(5) and SO(10). Supersymmetry extends the Standard Model by adding an additional class of symmetries to the Lagrangian. These symmetries exchange fermionic particles with bosonic ones. Such a symmetry predicts the existence of supersymmetric particles, abbreviated as sparticles, which include the sleptons, squarks, neutralinos and charginos. Each particle in the Standard Model would have a superpartner whose spin differs by 1/2 from the ordinary particle. Due to the breaking of supersymmetry, the sparticles are much heavier than their ordinary counterparts; they are so heavy that existing particle colliders would not be powerful enough to produce them. However, some physicists believe that sparticles will be detected when the Large Hadron Collider at CERN begins running. String Theory is a theory of physics where all "particles" that make up matter are comprised of strings (measuring at the Planck length) that exist in an 11-dimensional (according to M-theory, the leading version) universe. These strings vibrate at different frequencies which determine mass, electric charge, color charge, and spin. A string can be open (a line) or closed in a loop (a one-dimensional sphere, like a circle). As a string moves through space it sweeps out something called a world sheet. String theory predicts 1- to 10-branes (a 1-brane being a string and a 10-brane being a 10-dimensional object) which prevent tears in the "fabric" of space using the uncertainty principle (e.g. the electron orbiting a hydrogen atom has the probability, albeit small, that it could be anywhere else in the universe at any given moment). String theory posits that our universe is merely a 4-brane, inside which exist the 3 space dimensions and the 1 time dimension that we observe. The remaining 6 theoretical dimensions are either very tiny and curled up (and too small to affect our universe in any way) or simply do not/cannot exist in our universe (because they exist in a grander scheme called the "multiverse" outside our known universe). According to preon theory there are one or more orders of particles more fundamental than those (or most of those) found in the Standard Model. The most fundamental of these are normally called preons, which is derived from "pre-quarks." In essence, preon theory tries to do for the Standard Model what the Standard Model did for the particle zoo that came before it. Most models assume that almost everything in the Standard Model can be explained in terms of three to half a dozen more fundamental particles and the rules that govern their interactions. Interest in preons has waned since the simplest models were experimentally ruled out in the 1980s. ↑ John R. Gribbin, Mary Gribbin, and Jonathan Gribbin, 2000, Q Is for Quantum: An Encyclopedia of Particle Physics. New York: Touchstone. ISBN 0684863154. ↑ Martinus J. G. Veltman, Martinus, 2003. Facts and Mysteries in Elementary Particle Physics. River Edge, NJ: World Scientific. ISBN 981238149X. ↑ E.S. Reich, and J. Hogan, June 2004, Quark experiment predicts heavier Higgs. New Scientist. Retrieved December 16, 2008. Elementary particles – The Elegant Universe, NOVA Series, PBS. The Review of Particle Physics – Particle Data Group. Season of Higgs and melodrama – CERNCourier. New results from the CLAS Collaboration Search for Pentaquarks. Particle Physics News and Resources – Interactions.org. This page was last modified on 14 September 2017, at 15:50.